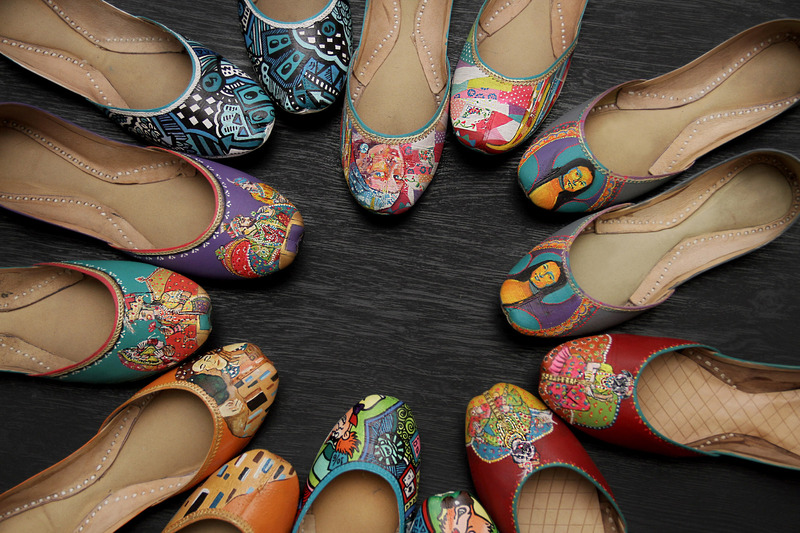 Taskeen Zahra chats with the dynamic trio, Faten Anjum Suleman, Rabia Ayub Bhatti and Farea Khan about their collective love of shoes! 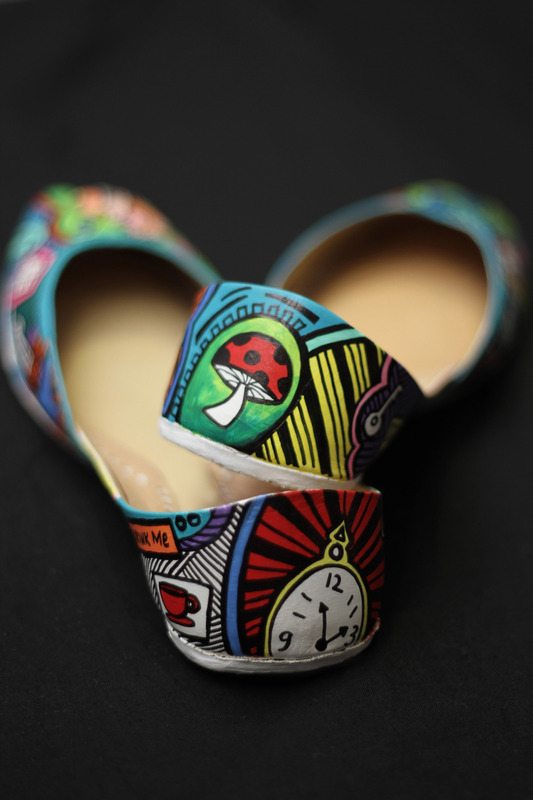 HOW DID YOU GET INTO PAINTING SHOES? Faten: It all started with me! 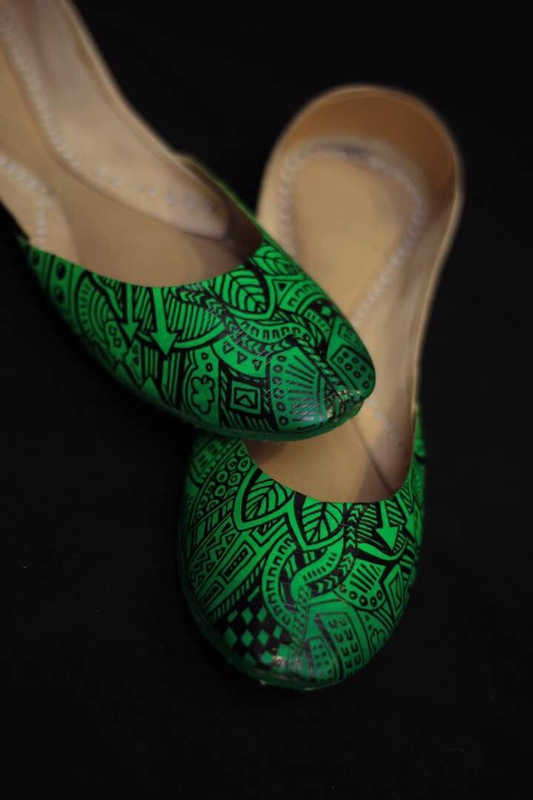 I paint everything in sight; my shoes, bag, bed, chairs, and even my TV! So I decided to share my passion with the world with the help of my friends Rabia and Farea. We might have started with the jootis, but we have so much more to share – after all, it’s all in the name. Stay tuned for the kapra and makaan to unfold. 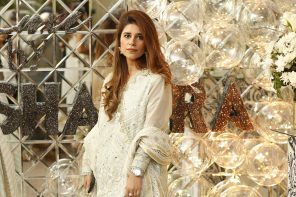 WHAT INSPIRED JOOTI KAPRA MAKAAN? WHERE DID THE NAME COME FROM? Farea: As a group of artists and designers, the company was inspired by our constant need to fidget, make and create. We, as individuals, are in different fields and have a range of expertise. We decided to fuse our skills to create JKM. Once we realized we could do this, our ideas began to take shape. We discussed things we wanted to do now and things to come in the future. Word play allowed us to come up with a pun from the very political slogan. We were hoping that the company name would play a role in describing the quirk in our work. Rabia: JKM at the moment is a bit of everything and can’t be classified under a specific style. However, pop culture is our most prominent theme. Presently, our designs range from miniatures to doodles to pop art of the master painters. HOW DO YOU GET INSPIRED? WHAT DOES CREATIVITY MEAN TO YOU? Faten: Inspiration comes in many ways to any creative mind. Be it a spark while watching a music video, or sitting idle staring at your toes. In the instance of ‘The Royal Pugslys’ this was the artist’s love for her own pup that was expressed on the jooti and the ‘Doodle Series’ was the result of the painful hours of sitting through boring lectures, haha. Rabia: We were always taught to think outside the box. But, by stating that a box exists, you limit yourself to be associated with it. There is no box, there never was. Design is a whole different dimension! Farea: Creativity is our driving force. A day without creative expression is a wasted day. Faten: Zaalima was my first jooti. It was the first time I took up miniature art. Since we were painting on khussas, I wanted the design to incorporate the desi factor completely. I loved the detail that went into making the shoe. Rabia: Blue Doodle. I’d been doodling everywhere, so this was second nature to me. I’ve seen doodles on Vans and Converses, but not on Khussas, and we take pride in being the pioneers. Faten: The concept might take a day or two to get the right colour pops, the right composition and proportion for our canvas. Once the concept is approved, based on the detail, the painting can take 2-4 days. WHAT MADE YOU WANT TO paint on KHUSSAS? Faten: All three of us are khussa fans! We grew up wearing them and it didn’t matter whether it was Summer or Winter, they were very much part of our style story. Rabia: We took the historical element of khussas and incorporated an artistic approach to it. The bazaar has cool truck art designs that we all love, but we wanted to make them more quirky. Farea: What’s not to love? You can wear them to shaadis as well as to itwaar bazar; the versatility of them is what makes them our go-to shoes. Rabia: They are our babies, we love them all equally! But if I had to… Zaalima. Farea: Zaalima, Klimt and Marvel. IS IT DIFFICULT BEING IN BUSINESS WITH FRIENDS? Faten: It’s easy working with friends. When we don’t like something, we fight, and eventually we make up. We always make a good team at the end. Rabia: We work better because we know each other’s strengths and weaknesses and can work around them. Farea: We’re in different cities which makes it a little difficult. But honestly, we end up balancing each other out. Nothing is better than working with your friends! Faten: I make mistakes but I don’t learn, haha. Rabia: What’s better than bossing your friends around? Farea: Calling all the shots is awesome. 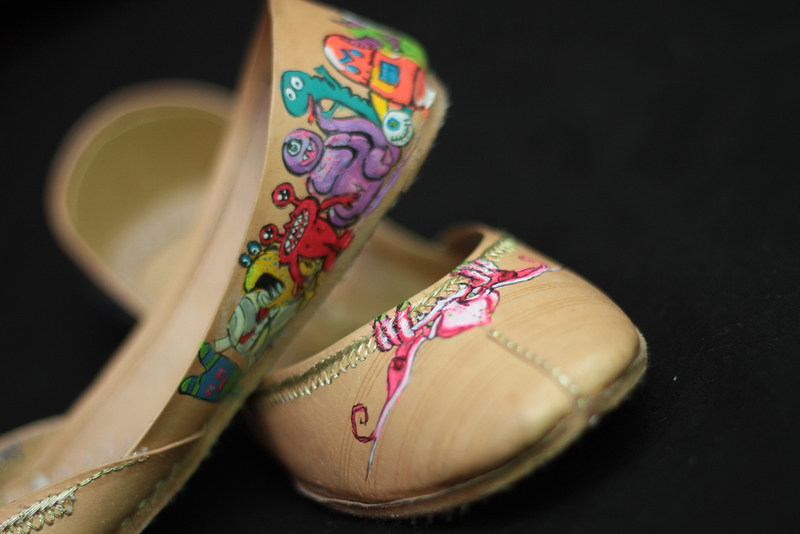 IF YOU COULD PAINT A PAIR OF SHOES FOR A CELEBRITY, WHO WOULD IT BE AND WHAT WOULD YOU MAKE THEM? Faten: Kimmy K, any day! I can picture her in khusas with dollar bills on them. Rabia: Meesha Shafi with a drumkit. Oh and in the goras, Liza Koshy. Farea: Can I say Marilyn Monroe or Audrey Hepburn? I’ll stick to home and go with Mahira Khan. I’d love to give her something with a vintage feel. Faten: This one time a girl said our shoe should be for a quarter of the price that it was. #Heartbreak. Farea: The problem with art is the understanding of it. We try to ensure quality and so we’ve imported paints from abroad and put in so much detail. A single shoe requires so much attention, but people in general don’t understand that. Faten: “Woman up and do it!” I got this advice while being scolded by the Leo in our group, haha. Rabia: Does it count if you get all your advice from memes?